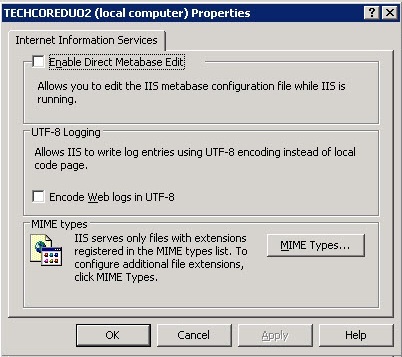 What additional configuration is necessary for IIS on a Windows Server 2003 Web Server? How to install RE:Anywhere, Faculty Access for the Web, and NetClassroom on Windows Server 2003 and additional configuration steps necessary for IIS on a Windows Server 2003 Web Server. Register IISSubA.dll to enable sub-authentication to manage passwords for anonymous accounts. Note: C:\Windows is the default path for the Windows folder in Windows Server 2003. If your installation uses a different path, you must adjust the command accordingly. Note: If you are using a Windows 2003 Web Server in version 7.75, skip to step 3. Faculty Access for the Web and NetClassroom use a new Application Pool created during the installation called Blackbaud App Pool (.Net 2.0). Leave the Identity of this App Pool as Network Service (the default). In IIS 6, run all worker processes using Anonymous authentication as LocalSystem. Click on Start > Run and in the Window that appears, type inetmgr and press Enter. Expand host (local computer) and Application Pools. 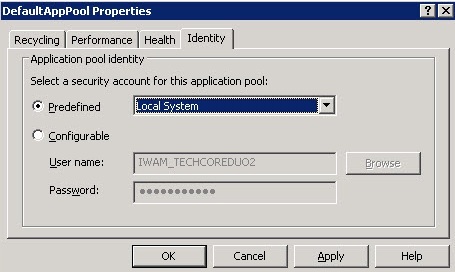 Select the Identity tab and change the Predefined Application Pool Identity to Local System from the drop-down menu. In IIS 6, set the status of the Web Service Extension for Server Side Includes, ASP.NET v1.1.4322 and Active Server Pages to Allowed. Expand host (local computer) and select Web Service Extensions. Click Allow for Server Side Includes, ASP.NET v1.1.4322, and Active Server Pages. Right-click on host(local computer) and select Properties. The host (local computer) Properties screen appears. Click MIME Types. A screen appears listing file extensions in alphabetical order. as the MIME type, and click OK.
To preview reports and mailings, a new Application Pool needs to be added to IIS (based on the default pool). The Report Viewer application then needs to be set to use this pool. Right-click on Application Pools and select New Application Pool. Specify a name and select to 'Use existing application pool as template' and choose DefaultAppPool. The identity of the new pool can be left at Network Service as long as DefaultAppPool is set to Local System. Under Web Sites, Default Web Site, select REWebRepView70, right-click and select Properties. Under Virtual Directory, Application Pool, select the new application pool created above. Specify NTFS security settings for the web application.